For many of course Easter is a Holiday season, but its also a far older traditional celebration time: Today it’s vernal Equinox – The sun will be directly over the equator and the day and night are equally long – all over the world! 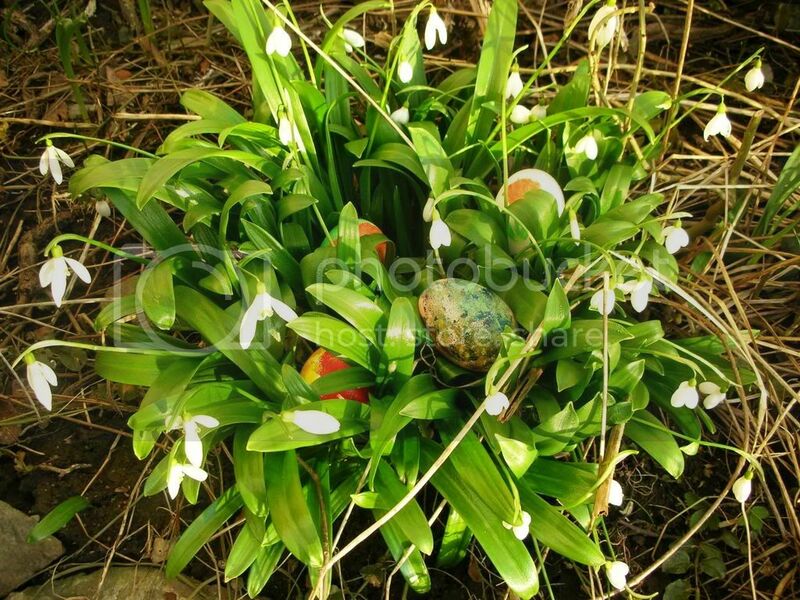 Thousands of years back, among Scandinavian Vikings it was marking the beginning of spring. Scilla. In front you can also spot wild strawberry leafs. Snow Bells – I so much remember these were the first flowers in my parents garden – so stubborn and often survived a late snow fall. Crocus often pop up on our lawn even before the grass is getting green. 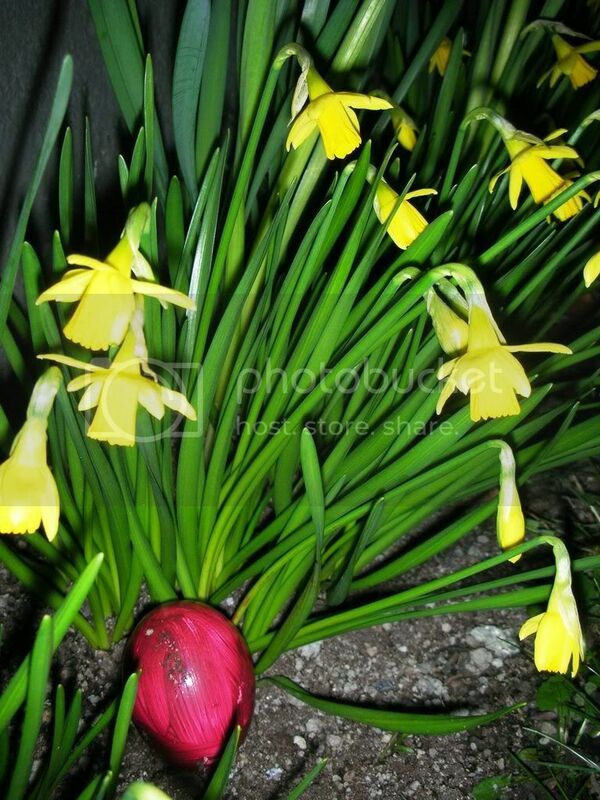 Narcissus pseudonarcissus or Wild daffodil – also called Easter lilly in Norway. What kind of Spring Flowers pop up in the spring in your neighbourhood? Post some pictures and I’ll update this posts with a link to yours! Still lots of snow up here in the north so no spring flowers yet. Thanks – actually I envy you having snow this winter – we’ve had too little! How lovely that your young friend was able to visit with you! She looks so sweet and as if she is having a wonderful time! Spring? I do not know. It is snowing again as I write! I guess you have seen some of my post with her visiting earlier – she’s so cute. It seams like all of you living around the lakes has got a lot of snow this year – you should have sent some over earlier in the season! Fantastic shots, Renny! The colours are so vivid! And spring has definitely started to lay its blooms all over Oslo! Thanks Mark – hope you’ll have a great Easter break in Oslo then! Hope you’ll have a good Easter Holiday anyway and of course that you can celebrate together with Odd in Norway next year! Dear readers of RennyBA, we sat here together, and Renny, what did he say, excuse me for a couple of minutes, yeah, that’s was he said. I did know nothing – we talked and had a wonderful Quiz, and suddenly he sais: Tor, you must comment my last post. – your last post, have you done a post while we have sitting here? The quiz – did we had that ?!? Only my daffodils and other narcissus, and a few hardy grape hyacinths are blooming here, Renny. Although, my red bud tree is about to burst into bloom, my flowering quince is blooming and the cherry and other fruit trees are just beginning to blossom. I hope we don’t lose them all in a late freeze! Well, its a good start over at your place too then, I would say! Oh.. i am sure you have also noticed that two weeks ago..some flowers staryed growing… sign of early spring as I thought.. but… yesterday and today it snowed! 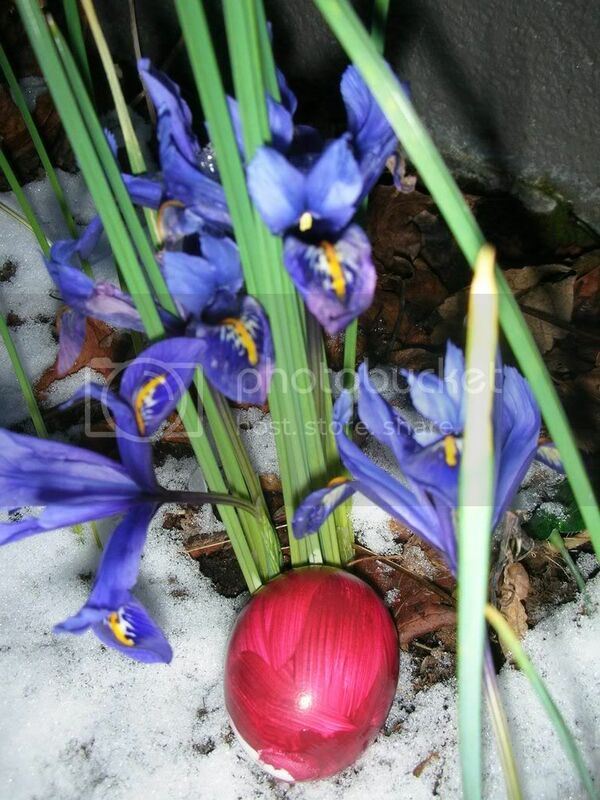 ahaaayyyy… Anyway, snow or not i am gonna hunt my easter egg.. Thanks for hopping hover then – always great to welcome new readers! Yea, the weather shifts a lot these days – hope you’ll have a great Easter Egg hunt anyway! Wishing you a great one too! Gotcha! N congrats for getting all those blogging awards. There’s definitely a lot of honesty in whatever u r doing coz otherwise, u wldn’t have got all those awards. And honesty demands a lot of time, patience, dedication and hard work. Keep up the networking! N blogging! Glad you found me Zahid and thanks for your compliments. Yea it takes some efforts and time, but even if it’s just a hobby, It’s worth it when you get all this recognitions. So I’ll keep up – with networking too of course! Renny – Beautiful photos of the eggs in nature. We too have made colored eggs and will celebrate early with our egg hunt tomorrow. In Maine where I grew up we have similar wild strawberry plants. The berries are tiny, but very sweet. Thanks for sharing spring in Norway. Same size and taste of the wild strawberry here – just wonderful! wow! you’ve got flowers blooming already and we don’t even have any little green shoots poking up through the grass yet! when they do arrive we get crocus first. some people around here have what we call snow drops, which look like shorter versions of your snowbells and they come out early too. when i was much further south in GA early this month i saw daffodils blooming too. So we are ahead of you – normally I think its verse versa. Keep us posted! We have almost the same fauna and climate you know and these spring flowers I think is kind of universal for the northern hemisphere. yes.. we seldom find good blog within our taste as millions of blogs in there..Once again thanks for dropping by.. if like we can exchange links. to my Fendi blog. Your welcome and I do agree. There are still snow up north, in the inland and the mountains. Snow is kind of seldom in Malmö I guess. We are in Mariestad right now and it was snowing a couple of days ago, but hardly any left. 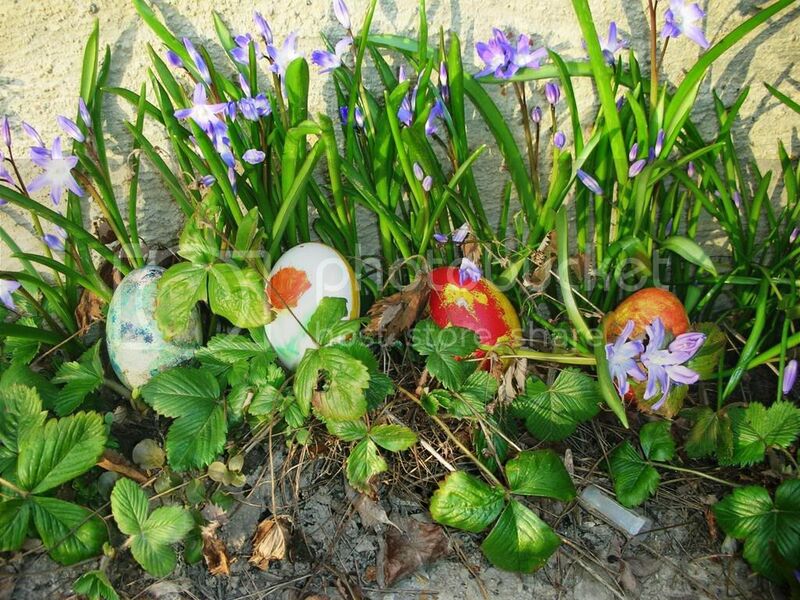 This reminds me to my childhood in Switzerland when I have found the selfpainted easter eggs hidden away between the same flowers we had in the garden. Thanks for sharing your family traditions from Europe – glad I could take you down the memory lane. I can’t think of any flowers that we’ll see popping up in my ‘hood. But in May/June, our landscapers will be planting impatients on our property (I live in a condo complex). Boil some eggs with a half onion. You will get a nice Easter collar. The first flowers maybe dandelions, they sneak in everywhere. Pretty pics and flowers. I have to dye Easter eggs with my kids tomorrow night or Saturday. Have a Happy Easter and Spring. Thanks – hope you’ll all have a fun and exciting hunt! Happy Easter to you and wife! Thanks for the visit and greetings – wish you all a good one too! Hi! Thanks for your message! The Holy Week is one of the most celebrated occasion in my country. Not necessarily celebrated but “observed”. I mean the life and passion of our Lord Jesus. Today, my whole family just stayed at home. Watch The Ten Commandments and the Passion of the Christ (DVD). Catholics for instance commemorate it by staging the passion of Christ, including the “nailing” to the cross. I am a renewed Christian and unfortunately, we don’t believe in those practices. Hi Ramil – great to see you – always nice to welcome new readers! Thanks for sharing your thoughts and family tradition about the season – it enriches the subject on this post theme and I love to read about it. Thanks also for the invitation to your movie collection – I’ll be right over. I will be following your track to learn more about how to make money online. Oh, Renny ~ these pictures are SO beautiful! It brings back such nice memories of Easter egg hunting when I was growing up. My father used to put them in the craziest places (under the couch cushions, etc.)! I apologize for not visiting here as much as I’d like. Work has been cranking busy, and I’ve also been apartment hunting with my husband. Thanks for the compliment Lisa – glad I could bring you back on your memory lane and thanks for sharing some of your family secrets. You don’t have to apologize – I know how it is with a busy schedule – you are one of my most trustful readers. Spring is not in the air here at all! We’re facing the prospect of snow for Easter — it feels more like Christmas. Your little friend did great job with eggs! Now we have daffodil here and anemone. I went to the gardening shop last week with my pupils where they planted Capucine. I stay tuned to tuesday! I’m so curious to see your Easter Bunny Eggs Hunt! Happy Easter! Don’t make like me who eat tooooo much chocolate! These are so nice to see! Too bad we can’t yet! We have snow cover still and quite cold weather still with -12 at night and still mostly below freezing in the day. At least we’ve had some bright sunny days but I’m afraid people will be hiding the eggs indoors! I heard you just got a dump of snow though…..too little too late, eh?!!! Enjoy Easter and all the great food and company. 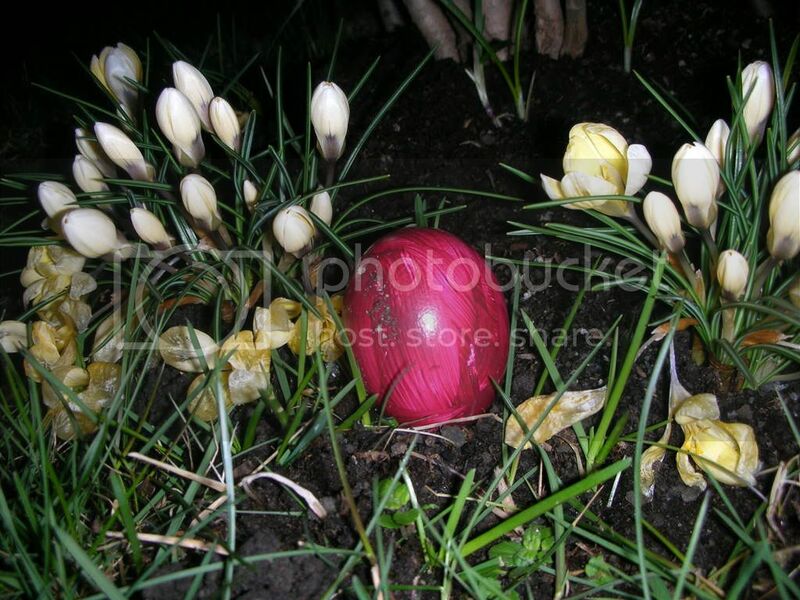 The easter eggs hidden in the garden brings back nice childhood memories… :) i enjoyed looking at them on your site now :) thanks! Happy easter to you!! Glad I could take you down the memory lane then and hope you’ll get back to see the Easter Egg hunt! Hope you’ve had a good one too! Do most people paint their eggs there? 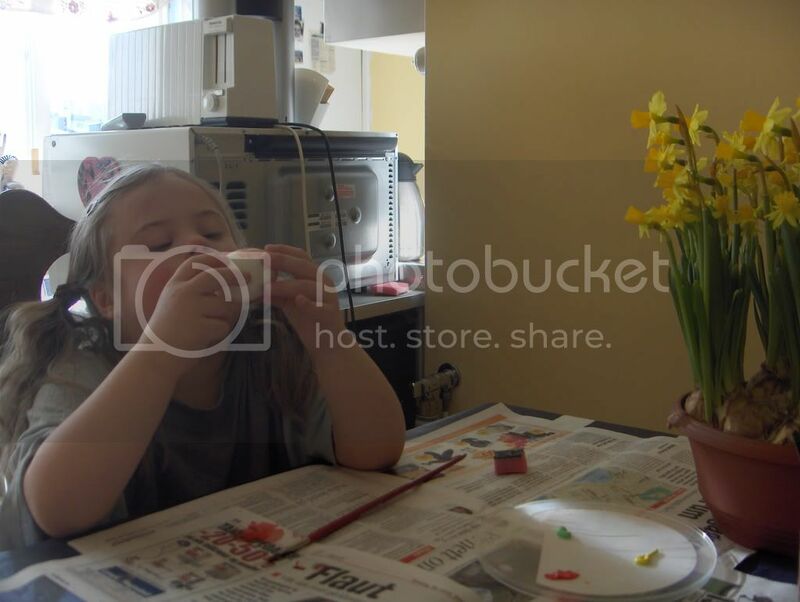 Here in the US we have Easter Egg dye kits but I love the way you’ve painted your eggs and wonder why I’ve never thought of that before ,lol…next year we’re painting them! I wouldn’t say most people, but the one with children I guess. Glad I could learn you a new way – keep us posted next year!